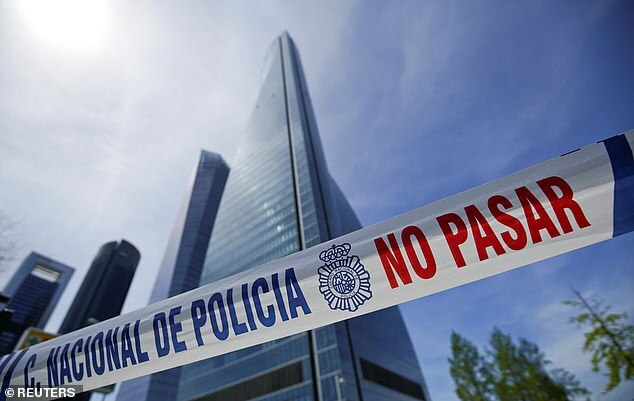 A skyscraper which is home to the British and Australian embassies in Madrid was reportedly evacuated over a false bomb alert. 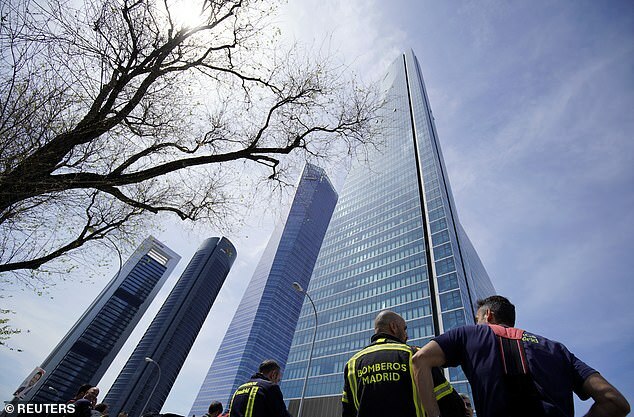 Police were understood to be clearing Torre Espacio, Spain’s fourth highest skyscraper and the 24th highest in Europe, floor by floor this afternoon. The building is also home to the embassies of Canada, Australia and the Netherlands. No-one from the British Embassy could be reached by phone early this afternoon. Private security staff at the Australian Embassy reported the ‘malicious call’ to Spanish police, according to El Confidencial. The Australian embassy said on Twitter that it would ‘remain closed for the rest of today, Tuesday 16 April, until further notice’. Dozens of National Police, Municipal Police, firefighters and emergency services cordoned off the area under anti-terror precautions. A Spanish police spokesman said: ‘A bomb threat was received…. Evacuation has started, we have to work and do checks. No injuries have been reported or any damage to the building. The skyscraper has 57 floors and around 2,000 people work there on a daily basis. 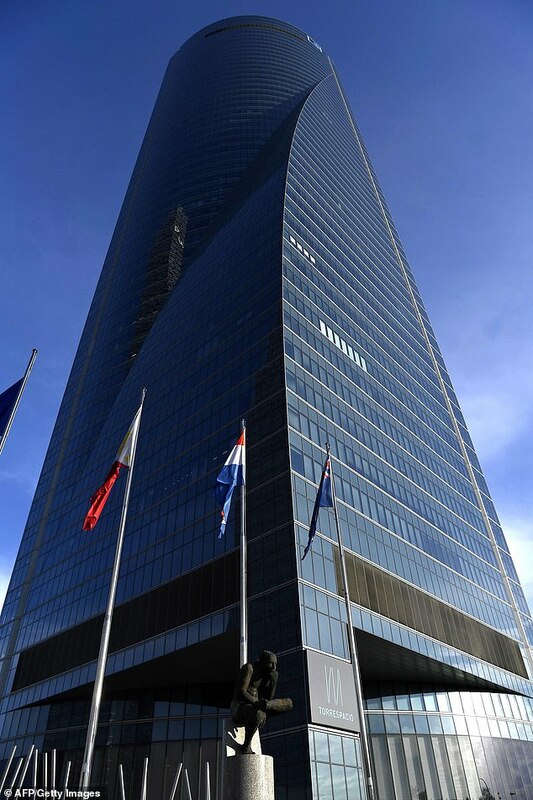 With a height of 770 feet (235 metres), the 57-story Torre Espacio building is one of four skyscrapers that makes up a business park in northern Madrid. 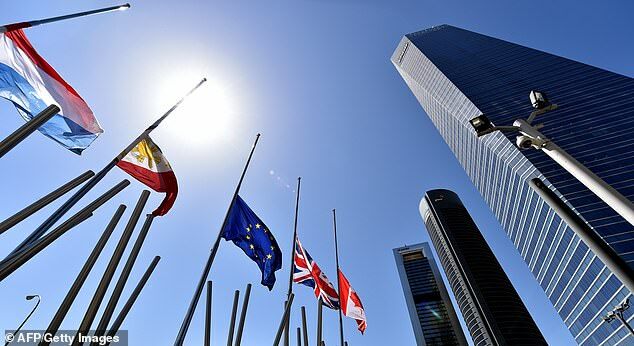 Shortly after the alarm was raised police confirmed the alert was a false alarm, according to Spanish newspaper Publico. Chief Inspector Jose María Benito reportedly told Telemadrid the alert was not due to a genuine bomb threat.